Desert Clickers (Ligurotettix coquilletti) are small grasshoppers found in desert areas with Creosote Bushes (Larrea tridentata) in the southwestern part of North America. I observed this male Desert Clicker one late summer evening here in Tucson, Arizona. The repeated "Zzzit" or "Zzzit Zzzit" calls (stridulations made by rubbing the hind femur against the body) of male Desert Clickers are a common sound here in the Sonoran Desert. The calls of male Desert Clickers can be heard throughout much of the day and night as long as the weather is warm. 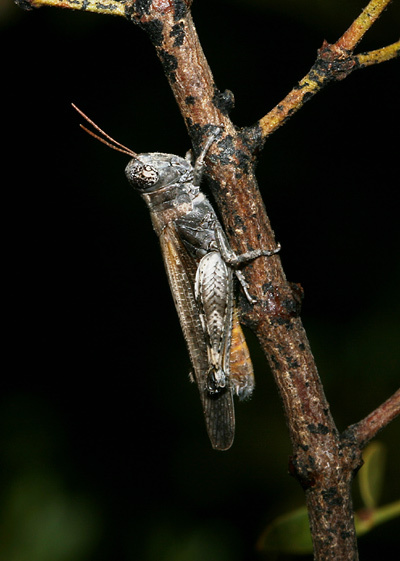 Although these grasshoppers are often heard, they are rarely seen because not only are they accomplished ventriloquists, they are also small, shy, and cryptically colored to match Creosote Bush stems. Although I could hear the male Desert Clicker above loudly calling, it took a great deal of searching and more than a bit of luck to finally spot him clinging to a Creosote Bush stem. Desert Clickers are only a little over 3/4 of an inch (2 cm) long and are a mottled brownish gray color with two darker bands on the femur, clear hindwings, and distinctive black eyes flecked with grayish white like snowflake obsidian. Desert Clickers feed on the foliage of Creosote Bushes, and the sedentary males spend much of their lives on a single Creosote Bush. The males are highly territorial and not only call to attract females, but also to warn away other males. The most sought after Creosote Bushes are those with low concentrations of the unpalatable compound nordihydroguaiaretic acid (NDGA). Each occupied Creosote Bush has a dominant male Desert Clicker and one or more silent subordinate males. The subordinate males try to intercept and secretly mate with any females attracted to the dominant male's calls. If the dominant male should encounter one of these intruding subordinates, he will chase and attack it.